You may be feeling excited about starting your course with us and may have some questions about how to prepare for your journey to Leeds Beckett University. To help you plan what you need to do, we have created an international arrival guide that shows you the steps to take before and after you arrive at university. We want to help you prepare for university and settle into your new life in the UK. 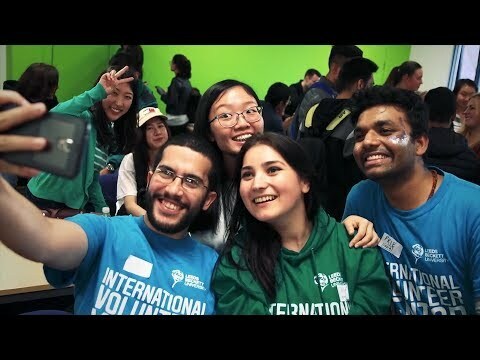 Our International Arrival video provides a useful guide on what to do before and after you arrive at Leeds Beckett University. We can meet you on arrival at Leeds Bradford International Airport and help you find transport for the final part of the journey to your accommodation. Our student ambassadors will be at the airport at designated times and are on hand to answer your questions. Our Meet and Greet service will be running on 14 to 20 January 2019. In the meantime, if you have any questions about our service or traveling to the UK email Student Engagement Office, Kat Firth and she will be happy to help you. If you have a Tier 4 Student Visa you will need to attend our International Check-In when you arrive at Leeds Beckett. International Check-In will run from Monday 21 January to Friday 1 February and you will need to bring your passport, student number, student visa and any other documentation you have been asked to bring. Check-In will be open from 10:30 to 15:00 on Headingley Campus. You must remember to attend your course induction as well as the International Check-In. Further details of an International Check-In at the City Campus will be available soon. When you arrive you will also need to attend an International Induction. This session is compulsory for non-EU students but you students from the EU may also find it useful to attend this session. You will find out about visas, banking, and our Leeds Beckett registration app. Once you have arrived, you can take part in many different events to help you settle in. This is a great way to meet other new students and sign-up to join societies and book some of our events and trips. Find out what's happening during our Welcome Week from 21 to 26 January. There are many opportunities to meet new people and start making friends when you arrive at Leeds Beckett. Our International Social Network arranges social activities, trips, clubs and societies for international students and you follow the Facebook group to find and more and keep-up-to-date with trips, social events, part-time job opportunities and much more. We also have an International Student Society as well as many other groups in our Student Union that you can join so you meet like-minded people. During your time at Leeds Beckett we will organise a variety of activities for you to join, including trips to some of the UK attractions such as Alton Towers and the historical city of York. You take part in community events around Leeds and volunteer to help with Christmas parties and celebrate UK holidays such as Bonfire Night and Burns Night. When you come to a new environment - whether it is a new country or university - it can sometimes take a little while to settle in. The 'Meet a New Buddy' event is here to help. Our current international and UK students provide support, advice and valuable experience that you can learn from, whether this is personal, practical or academic. Most importantly it is a great way to make new friends and learn about the social side of Leeds Beckett in the first few weeks of arriving in Leeds. If you are interested in taking part, please email Kat Firth on k.firth@leedsbeckett.ac.uk. During Welcome Week you can find out the International Students' Club. This is a club you can join on Wednesdays, 18:00 - 19:45 and practice your English and meet new people. For more information and details of where to meet, please visit the International Students' Club website. We also work with the tourism company Don't be a tourist who has selected top destinations in the UK and Europe for you to explore. Please note that the cost of these excursions is not included in your course fee. There are loads of events on every day across Yorkshire - make the most of your time and check out What's on in Yorkshire.